Familiarity with Arabic verb types is important for correct verb conjugation and usage. These types are based on the structure of the verb root, the component letters of the verb root, whether the verb requires a complement, and the tense or time of verb. These are simple triliteral verbs. Their component letters can include weak letters. Each letter constitutes an integral part of the verb meaning. This kind of verbs make up the bulk verbs in Arabic. Through letter addition, many other related verbs can be derived from them. These are simple four-letter verbs. Like the triliteral, each letter is essential for the verb meaning. This kind of verbs is few in Arabic, and they are rarely used. These are triliteral complex verbs because their roots comprise only three letters. To the root, a letter, two letters, or three letters are added. This is what makes them complex. The added letters add more meaning to the root; that is, the new meaning is different from that of the root but is still related to it. For example, اِسْتَوْقَفَ is from the root وَقَفَ which means ‘to stop’ while اِسْتَوْقَفَ means ‘to request someone to stop’. These are four-letter complex verbs because their roots comprise only four letters. A letter or two are added to the root to form new verbs with slightly different meanings. As mentions above, these verbs are few in Arabic, and they are rarely used. The root of these verbs does not include a weak letter, so they are regular verbs (i.e. their conjugation is regular). A regular verb can be a triliteral verb ثُلاثِي, as in (أ); a four-letter verb رُبَاعِي, as in (ب); a five-letter verb خُمَاسِي, as in (ج), or a six-letter verb سُدَاسِي, as in (د). 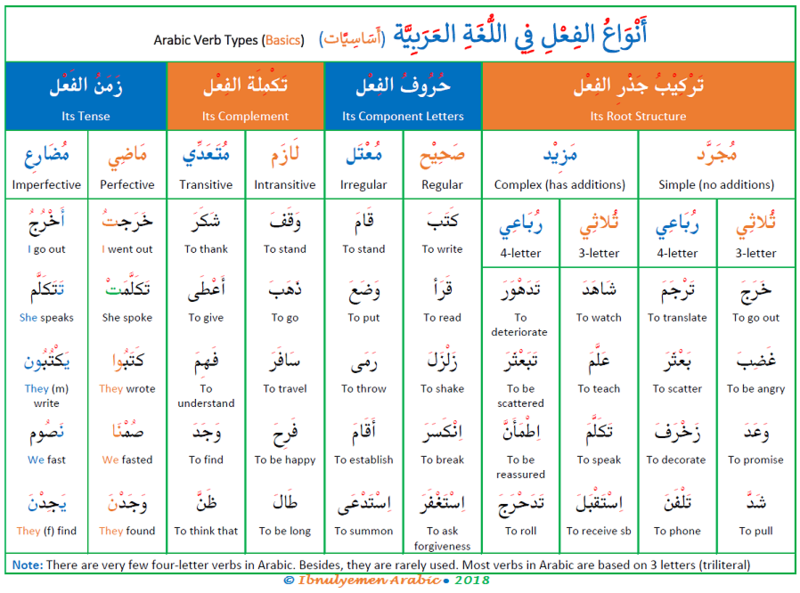 Note that the verbs شَاهَدَ, قَاتَلَ, and تَقَاتَلَ are regular because their roots are شَهَدَ and قَتَلَ. The root of these verbs includes a weak letter (i.e. و ، ا ، ي); therefore, they are irregular (i.e. have irregular conjugation). The irregular verb can be a triliteral verb, as in (أ); a four-letter verb, as in (ب); a five-letter verb, as in (ج); or a six-letter verb, as in (د). These verbs are intransitive because they do not require an object to form a meaningful sentence. These sentences are meaningful without an object مَفْعُول. The are composed of a verb فِعْل followed by a subject فَاعِل. These verbs require an object مَفْعُول to make a meaningful sentence. They are transitive verbs. · أَعْطَىَ مُحَمَّد عَلِي كِتَابًا – Mo gave Ali a book. These verbs are in the perfective (past) form. They express an action that took place in the past. The subject الفَاعِل of these verbs is an attached pronoun which refers to a noun that is stated (in a context) before the verb. For example, with شَاهَدْنَا, the subject is ـنَا, and it refers to more one speaker mention before the verb. These verbs are in the imperfective (present) form. They express an action in the present or at the time of speaking. As explained in previous lessons, the subject الفَاعِل of these verbs an overt attached pronoun or a covert pronoun indicated by the prefix on the verb.